Project Zero Classroom continues to push my practice almost 11 months after the event. This year I’ve been exploring how the use of screencasting might amplify the use of these routines in class. What has been particularly interesting isn’t that the children follow them – it’s when they start to adapt them for their own purposes. A few weeks after introducing looking ten times two earlier in the year- one of my little Year 4s piped up – it’s not just that you should look twice. You need to think twice too! Now that we are a few weeks into the unit, I thought it would be a good time for the children to return to our initial provocation. The children listened to their first thoughts about a bottle of water and the chorus of giggles came up. What was interesting is that a few of the children were already making comparisons about their thinking without any guidance from me. One even started to adapt the routine – I used to think, Now I think, I didn’t think of.. The child has outlined their learning for the rest of the unit both in terms of knowledge but also skills and attitudes they need to develop. What was interesting were the children who were turning to the class Flickr account and their own camera roll to find images to show their learning. This is a world away from when I initially started capturing student thinking where children were merely reading off the rubric. However there were problems. Some children had difficulty accessing the videos due to the current school internet settings. The importance of an object to focus the children’s thinking about a big conceptual idea. They aren’t just learning about water as a resource but how to view the world. What was the impact of the children hearing themselves think? 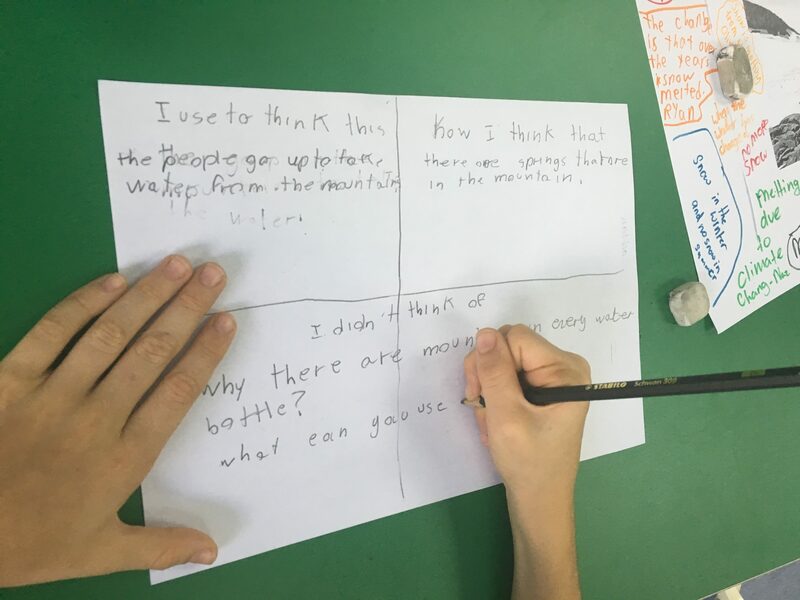 Would they have made as deep connections to their previous learning if they had documented their learning through writing or drawing? Helping the children to make those connections of the attitudes and approaches to learning that enable them to reflect on their learning. What makes the end of the year so challenging?